Don’t stand on the tracks when the train’s coming through! Not long after President Trump declared a national emergency at the southern border, Democrats vowed to fight. Speaker Nancy Pelosi even said she’d block Trump’s emergency order. As the entire nation could’ve predicted, POTUS was none too pleased. He fired back at Nancy, guns blazing. President Donald Trump vowed Friday to veto any legislation attempting to block his State of Emergency declaration on the Southern border. “One hundred percent,” Trump said when asked by reporters at the White House if he would veto any legislation trying to block his order. 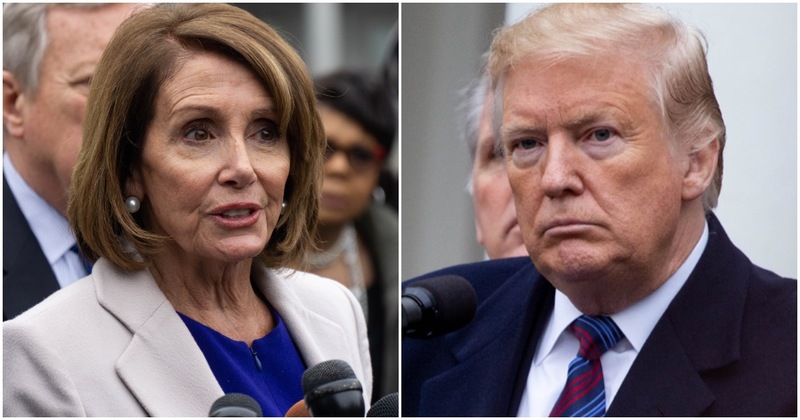 House Democrats led by Speaker Nancy Pelosi introduced a resolution on Friday to block Trump’s declaration. Dems know they can’t stop Trump for going through with the national emergency order. They are simply doing what they think their constituents want them to do, which is to fight Trump every step of the way. Could that be any more obvious? “The January jobs report holds some encouraging news, but it belies the lasting financial damage that the Trump Shutdown has inflicted on hundreds of thousands of Americans across the nation. Federal workers, many of them veterans, saw their financial security shaken, their credit ratings harmed, and their lives upended by the longest shutdown in history. And now, with families still hurting, President Trump refuses to take a second senseless shutdown off the table. “Meanwhile, House Republicans overwhelmingly voted against a pay raise for federal civilian workers, refusing to respect the perseverance and patriotism of the men and women who were just furloughed or forced to work without pay. This consistently callous GOP attitude disrespects workers, dishonors our values and damages our economy. Pelosi has been known for suffering brain freezes in the past. If it happens one, two times, no big deal. The thing is, Pelosi is constantly caught slurring her words and messing up routine gestures. This clip below is no different. As the House Speaker gave her weekly brief press conference, she could be seen suffering brain freezes, confusing millions and billions, and at one point, caught herself holding up only five fingers while talking about six bills. “We’ve already had a committee, uh, uh, uh, committees, the, uh— Ways and Means Committee and the Oversight Committee— Government Reform and Oversight Committee,” she struggled to say. While talking about the amount of money Democrats want to spend, she mistakenly said “$1 billion” instead of “$17 billion,” then said “$9 million” before changing it to “$9 billion”.